Life isn’t something that comes out of a perfect box, so you can successfully put all the pieces together. If you’re a student trying to figure out your way, even in the best of situations it’s difficult. It can be near impossible for students who, every day, choose whether learning is worth the trouble, because getting there seems so unattainable. Recently, I had the privilege to witness students achieving in a high school environment that works. DeSoto High School in the DeSoto Independent School District (DISD), DeSoto, Texas has figured it out. 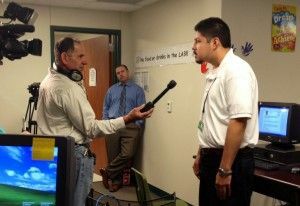 During a streaming presentation to local and national media, at the school, I was fortunate to be in the right place, at the right time, to hear it, and be able to share it with you. There are a combination of things happening, together, to help students succeed at DeSoto High School, which uses a College and Career Academy system to support their curriculum. DeSoto’s five academies—Arts & Performance, Business & Technology, Health & Science, Classical, and Professional are the foundation. So, from the start, students make choices that place them into curriculum and course studies that matter to them. Another puzzle part is having the right people guiding students. One of these influential educators is Melvin Barnes, the school’s Transition Coordinator. He helped lead students in discussing their learning at the presentation I attended. Barnes works with students based on vocation interests, translates that into secondary education opportunities for his students, as well as employment opportunities—in their chosen fields after graduation. I think that those parts are essential to the DeSoto plan, but there was one added piece that helped make it a student plan. DeSoto High students are using MyGraduationPlan to get them through the courses they need, and keep them on track for that graduation walk. Each student, who talked at the DeSoto presentation shared that this was an integral part of their achievement, because they had learned to plan for success by using it. MyGraduationPlan for DeSoto students answers the planning ingredient. I was talking to a friend of mine about what I had witnessed, right after the presentation. He said, “Most times I don’t think people talk about expectations enough. Then they are easily saddened when they aren’t realized.” I told him that a closer look at DeSoto and DISD might be in order. It seems they are not only talking about it, but also doing something about it—and the students, not the adults, are the ones with the expectations. And that’s what we’re after, right? While I’ve talked about the academy role in this, I really think that when students plan their own path, it sometimes motivates them beyond any expectations we, as educators, may have for them. I’m all for more education stories like that. I need to say that the students who spoke were success stories in more than just school, but in life as well. I will not forget these students, and what they said, or the rough road they travel each day to do what they need to do. One student, in particular spoke so eloquently about what he wanted to be and the challenges he faced—taking care of his siblings, working, and school—daily. The student positively shared how he talks to his family and others—cheer-leading them on—to do more with their lives. I kept thinking that this kid was not only a role model at 17, but someone any corporation would want working for them. Every adult listening was in awe. In the poorest communities, the wealth is where you’d expect to find it—in our students—but the necessary nurturing needs the right plan. DeSoto has students who have a plan and know what they want to do—and know that what they plan is doable. That’s a recipe for success, and it need to be replicated.